She tells me she ran from God for years. But now she’s running into his arms. Mary Lou is just one of the thirty people in our group being baptized today. Others tell me of years lost to drugs or alcohol. Some have simply never been baptized after confessing faith decades ago. But for all of them, this is clearly a big deal. A crowd gathers to watch. I look each person in the eyes, one at a time, and ask, “Have you placed your trust in Jesus Christ as your Lord and Savior?” I can see tears in their eyes and a glow on their faces. They all know: Jesus is not just Savior of the World. He is Savior of them. We’re baptizing in the Jordan River at a place called Yardenit, close to where the river exits the Sea of Galilee to flow toward the Dead Sea. This is the same river Jesus was baptized in by his cousin John. But not the same spot. Remember how the Essenes, who also lived in that desert, helped spread the expectation that a Messiah was coming? Well, John’s message is that the long-awaited Messiah is almost here! Like the Essenes, John criticizes the religious power structure in Jerusalem. And it was a bureaucracy worthy of criticism. Why were John, and many others, so critical of the Temple leadership? 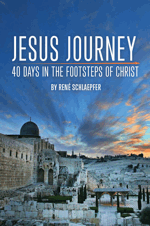 In 167 BC, about two hundred years before Jesus begins his earthly ministry, there was a revolution in Israel. The foreign oppressors are kicked out. The Maccabees, a Jewish rebel army, free Jerusalem. The Hasmonean dynasty begins. And one very important change is introduced that has implications for years to come: They make the office of high priest not just religious, but political as well. The high priest becomes the leader of the nation, the top diplomat, the authority over every living Jew in the world, more powerful in many ways than even the king. And when the mighty Roman army rolls into town, the ruling Jewish dynasty agrees to a peaceful transfer of power, as long as they retain just one small privilege: the right to appoint the high priest. After all, they insist, what interest would Romans have in Jewish religion? The Romans, perhaps not entirely aware of just how powerful the priesthood had become, agree. For years afterward, the high priest is selected not on the basis of religious credentials, but on his ancestral connection to the Hasmonean family. The leading priestly families become the “godfathers” of life in Israel. Little is accomplished in the country without their cooperation and approval. And the capo di capo, the head of the families? The high priest. Of course, an elaborate Temple system evolves to line the pockets of these priests. One way or another, the high priest’s office charges for nearly every religious service — enough to pay for at least ten thousand priests in the city of Jerusalem alone. On top of all this religious bureaucracy, there’s the corrupt secular government. In John’s time, although Herod the Great had died, his family members were still political power brokers. Two of Herod’s sons, Antipas and Philip, were the short-tempered, corrupt rulers of the Galilean provinces, while the Roman prefect Pontius Pilate ruled Judea. All of these rulers had one response to criticism: violence (John will experience this later when, after he criticizes Antipas, he is imprisoned and beheaded). This religious and political background explains why the Essenes withdrew to the Judean wilderness near the caves at Qumran. With the government controlled ultimately by the pagan Romans, and in practical terms by a corrupt line of high priests who are all part of the same family dynasty, they see no hope for reform — until the Messiah arrives to kick all the bums out. So now here comes John, preaching that the Messiah will soon set all things right. This is why Luke sets up the historical context for John’s ministry so deliberately, with the names of Pilate and Herod Antipas and Philip and the high priests Annas and Caiaphas and others. These names are like a rogue’s gallery of scoundrels and tyrants. But John’s preaching isn’t just aimed at the bureaucracy — “The Man” — and how corrupt he is. John makes his message very personal for each one listening. John says, essentially, “You’re the Man.” He does not allow the people to get self-righteous and point fingers just at the power structure. He warns them to see the evil in themselves too, and repent of their own sinfulness. John says each individual must get ready for the Messiah’s pending arrival, because, he implies, who knows what the Messiah will do? He may just decide to wipe out all the corruption by smiting anyone who is corrupt! So the people who turn out to hear John are eager to know: What does God want me to do as I prepare for the Messiah’s arrival? I imagine a tense silence as people wait for John’s answer. Importantly, John does not tell people to go to the Temple to atone for their sins. He doesn’t talk about keeping the religious law, either. He doesn’t ask them to withdraw from society. Or give up hummus. He even discounts the importance of their ethnic Jewishness: He says God can create children of Abraham for himself out of whatever and whoever he wants! Instead, John preaches that what really matters is individual repentance of the heart. And real inward repentance will result in changed outward behavior. John’s message is a recovery of the prophet Isaiah’s emphasis on sincere faith — resulting in a changed life — not religious law, an emphasis that Jesus will continue. Not: Behold the King who replaces the Romans. Not: Behold the Priest who purifies a corrupt religion. deep. It’s soul-deep. And so we need a soul-Savior. There is so much in what happens in the next instant. Don’t miss the wording — the heavens did not just open. Something merely opened can be closed again. They were torn open. What’s torn open stays open. When the curtain opens to reveal the Messiah, it is ripped apart. And that tear is never mended. In fact, it gets bigger. Mark’s only other use of the word “torn”? Stay tuned for that part of the story. It’ll rock your world. But what happened right after Jesus was baptized was like a scene from a horror movie. Think back over the first few days of focusing on Jesus. How has it impacted you so far?